Operating in Clifton, New Jersey since 1993 we have served many homeowners and property managers in the service of sidewalks, walkways, and driveways. We'd be delighted to offer our sidewalk and driveway repair and installation services to you too. We shall be glad to build, maintain, or repair your Clifton sidewalks. Just as no job is too big, for AAP Construction – a no-fuss, all-business end-to-end masonry service – no job is too small either. Have your Clifton sidewalk's slabs shifted? Have gaps developed between a few slabs? Not to worry. AAP Construction will repair what others may not have done right. Simply phone us at (973) 298-1013. A knowledgeable and experienced Clifton mason will pay you a visit, inspect your damaged sidewalk, and provide you with a no-pressure, fair-price quote. 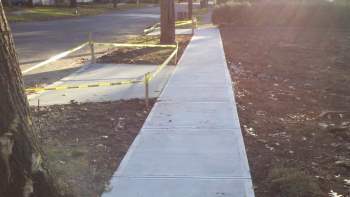 AAP Construction will begin by providing you with choices for your sidewalk. You may like no-frills concrete slabs for your Clifton property. Or you may want something fancier, such as large, mosaic-inlaid tile-like slabs. Slabs are available in a variety of colors, sizes, and finishes so you can customize your sidewalk. If we build your sidewalks using slabs, given the experience we've gained since 1993 we will take care to do slab stabilization as need be. If you'd like poured-concrete sidewalks for your Clifton's property, we will place forms end-to-end, lay a bulkhead, and pour concrete into the forms – but not without first doing excavating, laying a gravel or limestone sub-base, and bedding and leveling it! Lastly, AAP Construction will finish off the work by impregnating inter-slab gaps with jointing material. Find out more! Call us today at (973) 298-1013 for a free Clifton sidewalk consultation and no-obligation quote.